High quality handmade boys bow tie by Because I'm Me. 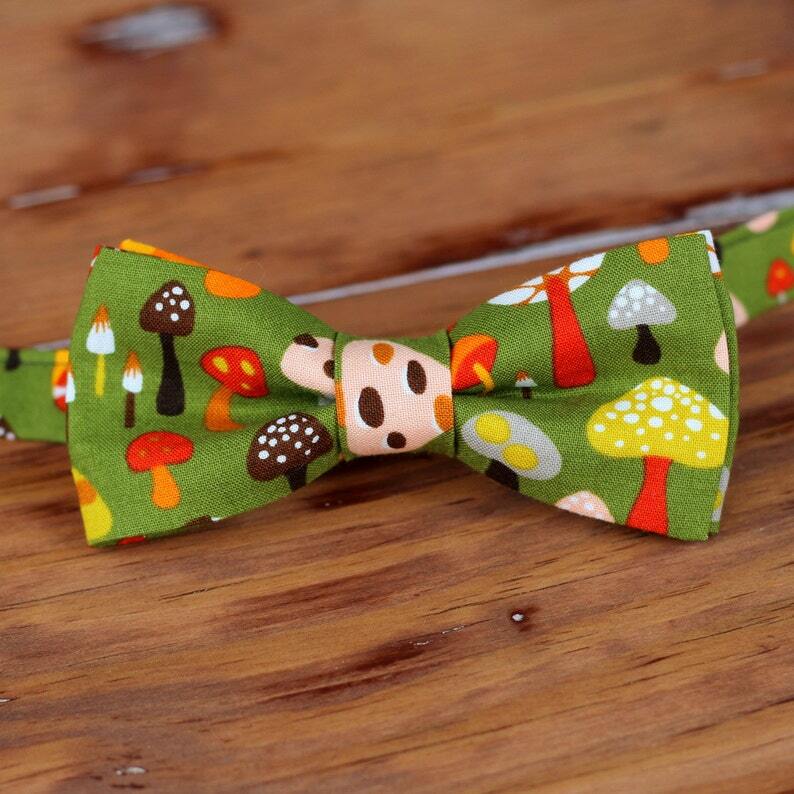 This great green cotton tie pays homage to the great fungus known as the mushroom, or toadstool. Where to wear this tie? The better question would be: Where could I possibly not wear this tie? And the answer is that it can, and should, be worn everywhere, of course. Four sizes of this tie are available: infant (0-3 years), toddler (2-6 years), child (4-8 years), and preteen (8-13 years). Perfect for casual, fun, dressy occasions. A variety of colorful mushrooms cover this green cotton. The ties are pre-tied with a full neck strap, giving the polished appearance of a self-tied tie without the work. Each tie is made to order, so will be unique. The infant tie has a velcro closure, allowing it to come undone easily if necessary. As always, adult supervision is required and Because I'm Me holds no liability. The neck strap measures approximately 11-12", with extra long velcro for adjustability. The preteen tie uses the same hardware as the toddler and child ties, with a neck opening of approximately 18".